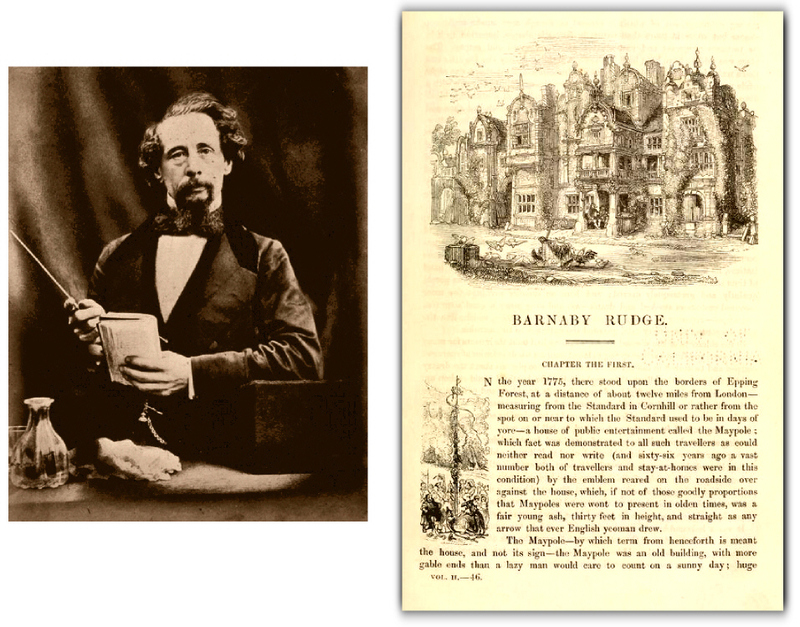 'Barnaby Rudge', the fifth of Dickens's novels, first appeared as a serial in 'Master Humphrey's Clock' during 1841. It shows the author's abhorrence of capital punishment, and from its references to the anti-Catholic Gordon Riots of 1780, it may be considered, along with 'A Tale of Two Cities', as one of Dickens' few historical works. In the year 1775 there stood upon the borders of Epping Forest, in the village of Chigwell, about twelve miles from London, a house of public entertainment called the Maypole, kept by John Willet, a large-headed man with a fat face, of profound obstinacy and slowness of apprehension, combined with a very strong reliance upon his own merits. From this inn, Gabriel Varden, stout-hearted old locksmith of Clerkenwell, jogged steadily home on a chaise, half sleeping and half waking, on a certain rough evening in March. A loud cry roused him with a start, just where London begins, and he descried a man extended in an apparently lifeless state wounded upon the pathway, and, hovering round him, another person, with a torch in his hand, which he waved in the air with a wild impatience. "What's here to do?" said the old locksmith. "How's this? What, Barnaby! You know me, Barnaby?" The bearer of the torch nodded, not once or twice, but a score of times, with a fantastic exaggeration. "How came it here?" demanded Varden, pointing to the body. "Steel, steel, steel!" Barnaby replied fiercely, imitating the thrust of a sword. "Is he robbed?" said the blacksmith. Barnaby caught him by the arm, and nodded "Yes," pointing towards the city. "Oh!" said the old man. "The robber made off that way, did he? Now let's see what can be done." They covered the wounded man with Varden's greatcoat, and carried him to Mrs. Rudge's house hard by. On his way home Gabriel congratulated himself on having an adventure which would silence Mrs. Varden on the subject of the Maypole for that night, or there was no faith in woman. But Mrs. Varden was a lady of uncertain temper, and she was on this occasion so ill-tempered, and put herself to so much anxiety and agitation, aided and abetted by her shrewish hand-maiden, Miggs, that next morning she was, she said, too much indisposed to rise. The disconsolate locksmith had, therefore, to deliver himself of his story of the night's experiences to his daughter, buxom, bewitching Dolly, the very pink and pattern of good looks, and the despair of the youth of the neighbourhood. Calling next day in the evening, Gabriel Varden learnt the wounded man was better, and would shortly be removed. Varden chatted as an old friend with Barnaby's mother. He knew the Maypole story of the widow Rudge - how her husband, employed at Chigwell, and his master had been murdered; and how her son, born upon the very day the deed was known, bore upon his wrist a smear of blood but half washed out. "Why, what's that?" said the locksmith suddenly. "Is that Barnaby tapping at the door?" "No," returned the widow; "it was in the street, I think. Hark! 'Tis someone knocking softly at the shutter." "Some thief or ruffian," said the locksmith. "Give me a light." "No, no," she returned hastily. "I would rather go myself, alone." She left the room, and Varden heard the sound of whispers without. Then the words "My God!" came, tittered in a voice dreadful to hear. Varden rushed out. A look of terror was on the woman's face, and before her stood a man, of sinister appearance, whom the locksmith had passed on the road from Chigwell the previous night. The man fled, but the locksmith was after him and would have held him but for the widow, who clutched his arms. "The other way - the other way!" she cried. "Do not touch him, on your life! He carries other lives besides his own. Don't ask what it means. He is not to be followed or stopped! Come back!" "The other way!" said the locksmith. "Why, there he goes!" The old man looked at her in wonder, and let her draw him into the house. Still that look of terror was on her face, as she implored him not to question her. Presently she withdrew, and left him in his perplexity alone, and Barnaby came in. "I have been asleep," said the idiot, with widely opened eyes. "There have been great faces coming and going - close to my face, and then a mile away. That's sleep, eh? I dreamed just now that something - it was in the shape of a man - followed me and wouldn't let me be. It came creeping on to worry me, nearer and nearer. I ran faster, leaped, sprang out of bed and to the window, and there in the street below - "
"Halloa, halloa, halloa! Bow, wow, wow!" cried a hoarse voice. "What's the matter here? Halloa!" The locksmith started, and there was Grip, a large raven, Barnaby's close companion, perched on the top of a chair. "Halloa, halloa, halloa! Keep up your spirits! Never say die!" the bird went on, in a hoarse voice. "Bow, wow, wow!" And then he began to whistle. The locksmith said "Good-night," and went his way home, disturbed in thought. "In league with that ill-looking figure that might have fallen from a gibbet. He listening and hiding here. Barnaby first upon the spot last night. Can she, who has always borne so fair a name, be guilty of such crimes in secret?" said the locksmith, musing. "Heaven forgive me if I am wrong, and send me just thoughts." It is seven in the forenoon, on June 2, 1780, and Barnaby and his mother, who had travelled to London to escape that unwelcome visitor whom Varden had noticed, were resting in one of the recesses of Westminster Bridge. A vast throng of persons were crossing the river to the Surrey shore in unusual haste and excitement, and nearly every man in this great concourse wore in his hat a blue cockade. When the bridge was clear, which was not till nearly two hours had elapsed, the widow inquired of an old man what was the meaning of the great assemblage. "Why, haven't you heard?" he returned. "This is the day Lord George Gordon presents the petition against the Catholics, and his lordship has declared he won't present it to the House of Commons at all unless it is attended to the door by forty thousand good men and true, at least. There's a crowd for you!" "A crowd, indeed!" said Barnaby. "Do you hear that, mother? That's a brave crowd he talks of. Come!" "Not to join it!" cried his mother. "You don't know what mischief they may do, or where they may lead you. Dear Barnaby, for my sake - - "
"For your sake!" he answered. "It is for your sake, mother. Here's a brave crowd! Come - or wait till I come back! Yes, yes, wait here!" A stranger gave Barnaby a blue cockade and bade him wear it, and while he was still fixing it in his hat Lord Gordon and his secretary, Gashford, passed, and then turned back. "You lag behind, friend, and are late," said Lord George. "It's past ten now. Didn't you know the hour of assemblage was ten o'clock?" Barnaby shook his head, and looked vacantly from one to the other. "He cannot tell you, sir," the widow interposed. "It's no use to ask him. We know nothing of these matters. This is my son - my poor, afflicted son, dearer to me than my own life. He is not in his right senses - he is not, indeed." "He has surely no appearance," said Lord George, whispering in his secretary's ear, "of being deranged. We must not construe any trifling peculiarity into madness. You desire to make one of this body?" he added, addressing Barnaby. "And intended to make one, did you?" "Yes, yes," said Barnaby, with sparkling eyes. "To be sure, I did. I told her so myself." "Then follow me." replied Lord George, "and you shall have your wish." Barnaby kissed his mother tenderly, and telling her their fortunes were made now, did as he was desired. They hastened on to St. George's Fields, where the vast army of men was drawn up in sections. Doubtless there were honest zealots sprinkled here and there, but for the most part the throng was composed of the very scum and refuse of London. Barnaby was acclaimed by a man in the ranks, Hugh, the rough hostler of the Maypole, whom Barnaby in his frequent wanderings had long known. "What! you wear the colour, do you? Fall in, Barnaby. You shall march between me and Dennis, and you shall carry," said Hugh, taking a flag from the hand of a tired man, "the gayest silken streamer in this valiant army." "In the name of God, no!" shrieked the widow, who had followed in pursuit and now darted forward. "Barnaby, my lord, he'll come back - Barnaby!" "Women in the field!" cried Hugh, stepping between them, and holding her off with his outstretched hand. "It's against all orders - ladies carrying off our gallant soldiers from their duty. Give the word of command, captain." The words, "Form! March!" rang out. She was thrown to the ground; the whole field was in motion; Barnaby was whirled away into the heart of a dense mass of men, and the widow saw him no more. Barnaby himself, heedless of the weight of the great banner he carried, marched proud, happy, and elated past all telling. Hugh was at his side, and next to Hugh came a squat, thick-set personage called Dennis, who, unknown to his companions, was no other than the public hangman. "I wish I could see her somewhere," said Barnaby, looking anxiously around. "She would be proud to see me now, eh, Hugh? She'd cry with joy, I know she would." "Why, what palaver's this?" asked Mr. Dennis, with supreme disdain. "We ain't got no sentimental members among us, I hope." "Don't be uneasy, brother," cried Hugh, "he's only talking of his mother." "His mother!" growled Mr. Dennis, with a strong oath, and in tones of deep disgust. "And have I combined myself with this here section, and turned out on this here memorable day, to hear men talk about their mothers?" "Barnaby's right," cried Hugh, with a grin, "and I say it. Lookee, bold lad, if she's not here to see it's because I've provided for her, and sent half-a-dozen gentlemen, every one of 'em with a blue flag, to take her to a grand house all hung round with gold and silver banners, where she'll wait till you come and want for nothing. And we'll get money for her. Money, cocked hats, and gold lace will all belong to us if we are true to that noble gentleman, if we carry our flags and keep 'em safe. That's all we've got to do. "Don't you see, man," Hugh whispered to Dennis, "that the lad's a natural, and can be got to do anything if you take him the right way? He's worth a dozen men in earnest, as you'd find if you tried a fall with him. You'll soon see whether he's of use or not." Mr. Dennis received this explanation with many nods and winks, and softened his behaviour towards Barnaby from that moment. Hugh was right. It was Barnaby who stood his ground, and grasped his pole more firmly when the Guards came out to clear the mob away from Westminster. One soldier came spurring on, cutting at the hands of those who would have forced his charger back, and still Barnaby, without retreating an inch, waited for his coming. Some called to him to fly, when the pole swept the air above the people's heads, and the man's saddle was empty in an instant. Then he and Hugh turned and fled, the crowd opening and closing so quickly that there was no clue to the course they had taken. For several days London was in the hands of the rioters. Catholic chapels were burned, the private residences of Catholics were sacked. From the moment of the first outbreak at Westminster every symptom of order vanished. Fifty resolute men might have turned the rioters; a single company of soldiers could have scattered them like dust; but no man interposed, no authority restrained them. But Barnaby, bold Barnaby, had been taken. Left behind at the resort of the rioters by Hugh, who led a body of men to Chigwell, he had been captured by the soldiers, a proclamation of the Privy Council having at last encouraged the magistrates to set the military in motion for the arrest of certain ringleaders. He was placed in Newgate and heavily ironed, and presently Grip, with drooping head and plumes rough and tumbled, was thrust into his cell. Another man was also taken and placed in Newgate on that day, and presently he and Barnaby stood staring at each other, face to face. Suddenly Barnaby laid hands upon him, and cried, "Ah, I know! You are the robber!" The other struggled with him silently, but finding the young man too strong for him, raised his eyes and said, "I am your father." Barnaby released his hold, fell back, and looked at him aghast. Then he sprang towards him, put his arms about his neck, and pressed his head against his cheek. He never learnt that his father, supposed to have been murdered, was himself a murderer. This was the widow's dreadful secret. And now Hugh, with a huge army, was at the gates of Newgate, bent on rescue. He had returned, to find Barnaby taken, and at once announced that the prison must be stormed. In vain the military commanders tried to rouse the magistrates, and in particular the Lord Mayor; no orders were given, and the soldiers could do nothing within the precincts of the city without the warrant of the civil authorities. In a dense mass the rioters halted before the prison-gate. All those who had already been conspicuous were there, and others who had friends or relatives within the jail hastened to the attack. Hugh had brought, by force, old Gabriel Varden to pick the lock of the great door, but this the sturdy locksmith resolutely refused to do. "You have got some friends of ours in your custody, master," Hugh called out to the head jailer, who had appeared on the roof. "Deliver up our friends, and you may keep the rest." "It's my duty to keep them all. I shall do my duty," replied the jailer, firmly. A shower of stones compelled the keeper of the jail to retire. Gabriel Varden was urged by blows, by offers of reward, and by threats of instant death to do the office the rioters required of him, and all in vain. He was knocked down, was up again, buffeting with a score of them. He had never loved his life so well as then, but nothing could move him. The cry was raised, "You lose time. Remember the prisoners! Remember Barnaby!" And the crowd left the locksmith, to gather fuel, for an entrance was to be forced by fire. Furniture from the prison lodge was piled up in a monstrous heap and set blazing, oil was poured on, and at last the great gate yielded to the flames. It settled deeper in the red-hot cinders, tottered, and was down. Hugh leaped upon the blazing heap, and dashed into the jail. The hangman followed. And then so many rushed upon their track that the fire got trodden down. There was no need of it now, for, inside and out, the prison was soon in flames. Barnaby and his father were quickly released, and passed from hand to hand into the street. Soon all the wretched inmates of the jail were free, except four condemned to die whom Dennis kept under guard. And these Hugh roughly insisted on liberating, to the sullen anger of the hangman. "You won't let these men alone, and leave 'em to me? You've no respect for nothing, haven't you?" said Dennis, and with a scowl he disappeared. Three hundred prisoners in all were released from Newgate, and many of these returned to haunt the place of their captivity, and were retaken. The day after the storming of Newgate, the mob having now had London at its mercy for a week, the authorities at last took serious action, and at nightfall the military held the streets. Hugh and Barnaby and old Rudge had taken refuge in a rough out-house in the outskirts of London, where they were wont to rest, when Dennis stood before them; he had not been seen since the storming of Newgate. A few minutes later, and the shed was filled with soldiers, while a body of horse galloping into the field drew op before it. "Here!" said Dennis, "it's them two young ones, gentlemen, that the proclamation puts a price on. This other's an escaped felon. I'm sorry for it, brother," he added, addressing himself to Hugh; "but you've brought it on yourself; you forced me to do it; you wouldn't respect the soundest constitutional principles, you know; you went and wiolated the wery framework of society." Barnaby and his father were carried off by one road in the centre of a body of foot-soldiers; Hugh, fast bound upon a horse, was taken by another. The riots had been stamped out, and once more the city was quiet. Barnaby sat in his dungeon. Beside him, with his hand in hers, sat his mother; worn and altered, full of grief, and heavy-hearted, but the same to him. "Mother," he said, "how long - how many days and nights - shall I be kept here?" "Not many, dear. I hope not many." "If they kill me - they may; I heard it said - what will become of Grip?" The sound of the word suggested to the raven his old phrase, "Never say die!" But he stopped short in the middle of it as if he lacked the heart to get through the shortest sentence. "Will they take his life as well as mine?" said Barnaby. "I wish they would. If you and I and he could die together, there would be none to feel sorry, or to grieve for us. Don't you cry for me. They said that I am bold, and so I am, and so I will be." The turnkey came to close the cells for the night, the widow tore herself away, and Barnaby was alone. He was to die. There was no hope. They had tried to save him. The locksmith had carried petitions and memorials to the fountain-head with his own hands. But the well was not one of mercy, and Barnaby was to die. From the first, his mother had never left him, save at night; and, with her beside him, he was contented. "They call me silly, mother. They shall see - to-morrow." Dennis and Hugh were in the courtyard. "No reprieve, no reprieve! Nobody comes near us. There's only the night left now!" moaned Dennis. "Do you think they'll reprieve me in the night, brother? I've known reprieves come in the night afore now. Don't you think there's a good chance yet? Don't you? Say you do." 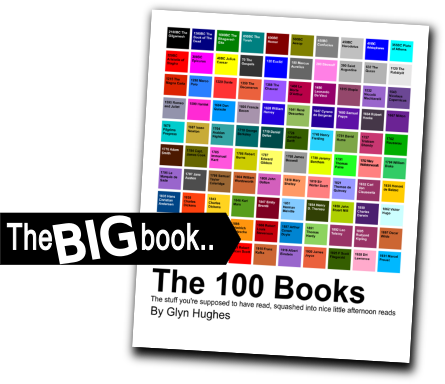 "You ought to be the best instead of the worst," said Hugh, stopping before him. "Ha, ha, ha! See the hangman when it comes home to him." The clock struck. Barnaby looked in his mother's face, and saw that the time had come. After a long embrace he rushed away, and they carried her away, insensible. "See the hangman when it comes home to him!" cried Hugh, as Dennis, still moaning, fell down in a fit. "Courage, bold Barnaby, what care we? A man can die but once. If you wake in the night, sing that out lustily, and fall asleep again." The time wore on. Five o'clock had struck - six - seven - and eight. They were to die at noon, and in the crowd without it was said they could tell the hangman, when he came out, by his being the shorter one, and that the man who was to suffer with him was named Hugh; and that it was Barnaby Rudge who would be hanged in Bloomsbury Square. At the first stroke of twelve the prison bell began to toll, and the three were brought forth into the yard together. Barnaby was the only one who had washed or trimmed himself that morning. He still wore the broken peacock's feathers in his hat; and all his usual scraps of finery were carefully disposed about his person. "What cheer, Barnaby? ", cried Hugh. "Don't be downcast, lad. Leave that to him," he added, with a nod in the direction of Dennis, held up between two men. "Bless you!" cried Barnaby, "I'm not frightened, Hugh. I'm quite happy. Look at me! Am I afraid to die? Will they see me tremble?" "I'd say this," said Hugh, wringing Barnaby by the hand, and looking round at the officers and functionaries gathered in the yard, "that if I had ten lives to lose I'd lay them all down to save this one. This one that will be lost through mine!" "Not through you," said Barnaby mildly. "Don't say that. You were not to blame. You have always been very good to me. Hugh, we shall know what makes the stars shine now!" Hugh spoke no more, but moved onward in his place with a careless air, listening as he went to the service for the dead. As soon as he had passed the door, his miserable associate was carried out; and the crowd beheld the rest. Barnaby would have mounted the steps at the same time, but he was restrained, as he was to undergo the sentence elsewhere. It was only just when the cart was starting that the courier reached the jail with the reprieve. All night Gabriel Varden and his friends had been at work; they had gone to the young Prince of Wales, and even to the ante-chamber of the king himself. Successful, at last, in awakening an interest in his favour, they had an interview with the minister in his bed as late as eight o'clock that morning. The result of a searching inquiry was that, between eleven and twelve o'clock, a free pardon to Barnaby Rudge was made out and signed, and Gabriel Varden had the grateful task of bringing him home in triumph with an enthusiastic mob. "I needn't say," observed the locksmith, when his house in Clerkenwell was reached at last, and he and Barnaby were safe within, "that, except among ourselves, I didn't want to make a triumph of it. But directly we got into the street, we were known, and the hub-bub began. Of the two, and after experience of both, I think I'd rather be taken out of my house by a crowd of enemies than escorted home by a mob of friends!" At last the crowd dispersed. And Barnaby stretched himself on the ground beside his mother's couch, and fell into a deep sleep.